Last school year, Jason went on a fishing field trip with Diego and his classroom to Floyd Lamb Park. Although it was a pretty cold day, they both had a lot of fun and Diego was very excited to have had a chance to try some fishing! He was ready try it again and kept asking when we'd go, so we decided to add it to our family Summer Bucket List. 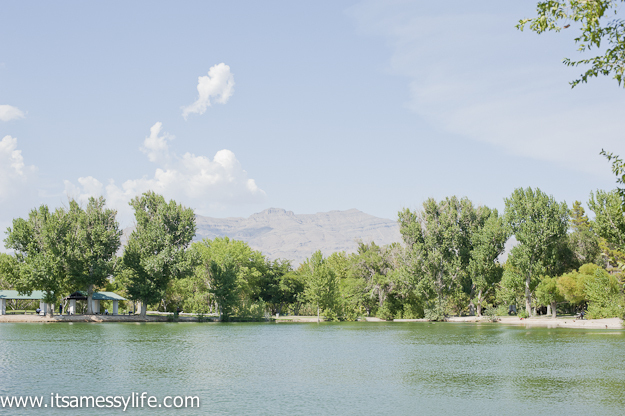 About two weeks we bought the kiddos some fishing rods and bait and made our way to Floyd Lamb Park at Tule Springs. This is a historic park found on the northwest side of Las Vegas. What makes this park so different, is that it has a nice lake and lush landscaping. It really is a nice oasis in the middle of the desert. Although it was was a hot day, it didn't feel so bad in the shade and there were some clouds too. I was a bit nervous since fishing isn't much of an "active" event. There's lots of sitting around and waiting and honestly, my kids are not too good at that. Surprisingly, the day went well. They enjoyed fishing a lot more than I expected and it ended up being a pretty relaxing afternoon. Of course, we didn't catch any fish but we still had a great time together as a family and that's all that matters! Posted in Summer Bucket List 2013 and tagged with fishing, summer, summer fun. July 30, 2013 by Jessie Emeric.